In 2014, the Duchess of Cambridge (Kate Middleton) visited New York City. She arrived at her hotel wearing Seraphine’s purple “Marina” maternity coat. The Seraphine Marina coat is made from a rich plum purple wool tweed bouclé fabric. It’s perfect for special occasions over the festive winter season thanks to a hint of sparkle that comes from subtle silver threads used in the coat’s fabric. The empire-line coat is collarless, features a frayed trim and is finished with black ribbon detailing. It hits just above the knee. The coat is part of Seraphine’s Luxe collection, which the company designed for special occasions. It costs £275 / $495. If you’d like to copy Kate’s pregnancy style, this coat is still available for purchase (as of September 2017) in limited sizes, though the company restocks sizes regularly. Kate wore one of Seraphine’s maternity dresses on two occasions while pregnant with Princess Charlotte in 2015. 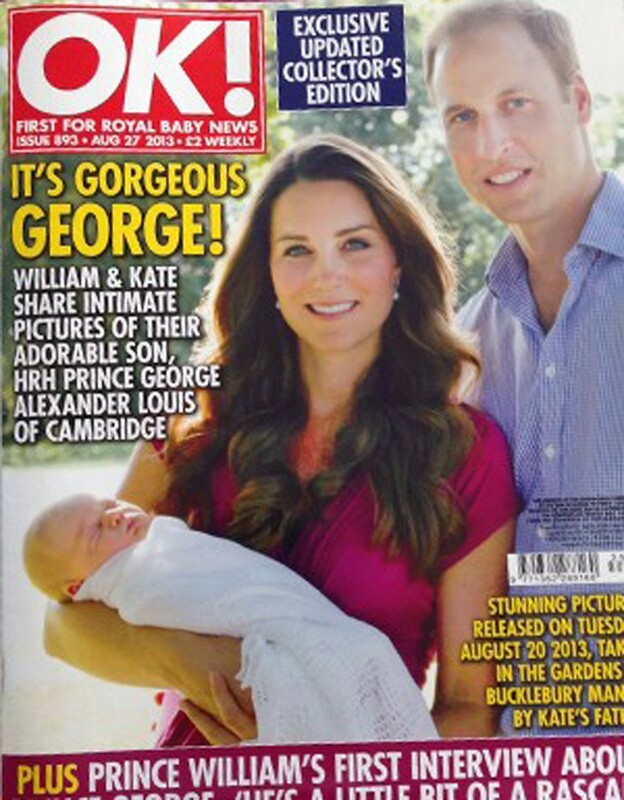 She’s also chose one of Seraphine’s dresses for an official portrait released shortly after the birth of Prince George (shown below on the cover of OK! Magazine). This is not an exhaustive list! To my knowledge, she’s worn at least two other dresses from the maternity wear company. Seraphine is a maternity wear company based in London. The brand is loved by pregnant celebrities and worn numerous members of European royal families, including Princess Victoria of Sweden, Princess Sofia of Sweden, Kim Murray, Anne Hathaway and Holly Willoughby. Founded by Parisian-born Cecile Reinaud in 2002, the company creates “fashionable clothes that you would want to wear even if you weren’t pregnant”. View more of Kate’s maternity clothing here.